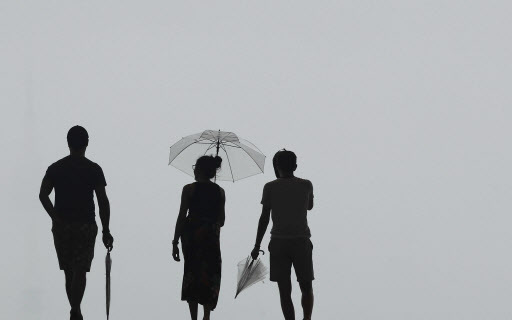 Residents of South Korea woke up to rainy weather Thursday morning, as the scattered rainfall over southern parts of the country expanded nationwide overnight. The rain will cease in the afternoon beginning from the southern regions but is expected to resume Friday morning. According to the Korea Meteorological Administration, most regions nationwide will receive less than 5 millimeters of rain throughout Thursday. On Friday, however, about 60 mm of rain will pour down over the central part and southern coastal areas of Korea. As the autumn rain cools temperatures, the big daily temperature range that had continued for the past few weeks will narrow. The daytime high in Seoul will record 23 C, Suwon 23 C, Gangneung 21 C, Daejeon 23 C, Gwangju 24 C, Daegu 24 C and Busan 23 C.
The weather on Paekdusan, where the leaders of South and North Korea are set to visit, will be sunny in the morning but will get gradually cloudy in the afternoon.